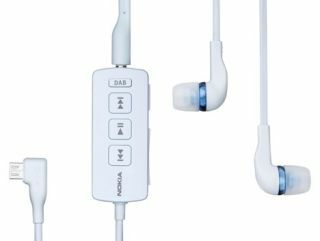 Nokia has announced the launch of the Nokia Digital Radio Headset – which works across its Symbian^3 handsets. The slightly wacky idea is being described by Nokia as a 'breakthrough for digital radio in the UK, linking with your N8, C7 or E7 handset and turning the phone into a DAB receiver. The Nokia Digital Radio Headset will cost £44.99 and has a UK release date of 'this quarter'. Mark Selby, Vice President, Industry Collaborations at Nokia comments: "Over 90 per cent of UK adults listen to the radio weekly and 24.6 per cent listen via a digital platform. Digital radio has a reputation of being problematic on the go, with the signal by no means consistent, but Nokia will no doubt hope that the add-on will be another feather in the cap of its flagship Nokia N8 when it arrives on Friday. Ford Ennals, Chief Executive of Digital Radio UK, said: "There is now real momentum in the transition to digital radio and the launch of the Nokia Digital Radio Headset is a real consumer milestone, delivering full DAB digital radio services and functionality in a mobile phone for the first time."